Retailers in the U.K. are dealing with some of the same challenges you face. Are there lessons you can learn from them? British operators seem to have put gardening “on hold,” particularly in the plant departments that were the world model three years ago. The key aspect of our past U.K. tours, “Silent Selling,” seemed to have been forgotten, and owners we challenged didn’t seem concerned at all. Now, it is not like the British had gone back to the 1970s. But with a few notable exceptions, none had continued developing that high-impact, educational and impulsive way of retailing plant material that we all snapped a thousand photos of a few years ago. There was little innovation or forward motion in the outside sales areas or in conventional gardening supplies indoors. In fact, many places had a tired look from the front of the “Car Park.” Some outdoor sales areas had simply been allowed to go backwards without even a screen or fence to hide them. Only one or two centers had continued the creative standards of merchandising, POP and even cleanliness in the plant areas that we took for granted in the past 20 years. Admittedly, the “Silent Selling” in the typical U.K. center is still way ahead of most stores in this country. But signs were faded, benches mossy and little new investment was seen. Some of those eye-catching display gardens were now looking weedy(! ), while others had been removed, leaving blank spaces where a landscape concession had pulled out. In the U.K., retail is essentially a self-service industry. Employees are primarily tasked with stocking, display merchandising, plant care and keeping those facilities spotless and impulsive. Obviously, labor had been severely cut back, and the result was a series of sloppy gardening and nursery departments. The centers had lost the very impact that we Americans went “gaga” over just a few short years ago. No longer a traffic driver. The U.K. operators we saw had not given up the business, but had switched their emphasis and resources to other departments and categories. They told us bluntly that they no longer see gardening as a traffic driver and don’t expect the situation to improve any time soon, so why pretend and continue investing in it? Green goods were never more than 35 percent of total sales in most of those places, but in the struggle to make a profit and justify the huge capital investments made in the past 10 years, plants and gardening have taken a backseat. A whole range of new or expanded categories, departments and ideas were being tried to fill the parking lot. About 15 years ago the U.K. turned away from using greenhouses for stores as they got bigger because the banks demanded a multi-purpose building to give secondary use in case the garden market went pear-shaped. Well the market has gone down, and the centers are looking more like department stores than they did even three years ago. The mixture was not universal with different companies trying different combinations of departments and products, but they were all certainly looking for the next magic bullet. All operators seem to be signing up concessions to sub-lease space, share overheads and drive traffic. We saw a bizarre range of concessions from scooters for old folk to telescopes, which suggests that category mix is a work in progress. The reasons, as they see it, are purely economic. Demographics rarely entered into their consideration because they do get a lot more young shoppers than in the U.S. attracted to the café, food, pets, wildlife, clothing and accents. The biggest expansion or increased emphasis was on food—local fresh food. Many garden centers in the U.K. are countering sagging plant sales with an emphasis on lifestyle products—and are being rewarded for their efforts. Readers who have not been across the pond and know British food from the Austin Powers movies would be amazed at the upgrading that has occurred there in the past 20 years. Food at GCs was big a few years ago—and is even bigger now. All stores have the obligatory “Food Hall” selling a complete line of fresh produce, a bakery, an onsite watch-them-as-they-whack-at-a-side-of-beef butcher, fresh fish, extensive cheese offers, juices and flavored oils. Some sold wine, beer and spirits; most had a large packaged gourmet food offer, too. All fresh food signage had beautiful graphics and named the farm, the variety of animal or bird, the source and the food-miles it traveled. U.K.-produced food and farming was a big emphasis. This change was merely an expansion of an existing activity, but the newest big addition was that they had all suddenly gone into cookery. Most stores had 500 square-feet to 5,000 square-feet stores-within-stores selling pots, pans and cookery gizmos (like Sur La Table stores here), mostly via concessions, but some had gone out and invested in the total category from nothing three years ago. We also noticed a downgrading of brand quality in gift accents and soft goods in some centers. Presumably the cheaper lines were brought in to chase a lower-spending consumer. This was not presented well in several cases and produced a very mixed message of low- to mid-value merchandise piled high, dime-store style, in new classy upscale facilities. More work in progress! What’s behind all this? Many stores we saw on our yearly tours were no longer owned by the original family, having been acquired by small chains of investment companies or, in one case, by Tesco, the U.K.’s biggest retailer. In good times this meant that they had capital to expand, marketing clout and the will to take risks. In weaker economic times, when those large repayments still have to be made, driving traffic becomes the number one criteria to management. Another, less-obvious factor is that in a small country (about the size of Michigan) garden centers are close to each other, and no one keeps a winning idea to himself for very long. This intense pride and competitive spirit between family owners is one of the main reasons for the super quality of U.K. garden centers in the past 20 years. Now, however, many of the larger stores are not run by nursery people but by general retailers who have no history in or feel for the garden business. So, weedy display gardens are just a fact of a recession budget. 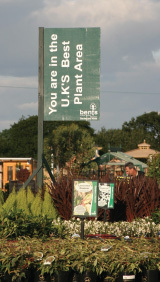 Bents Garden Center, a third generation gem near Manchester, was the store that upheld the faith as it remains superb in both vision and execution. Far from turning away from gardening, the staff there told us that they are investing in a significant expansion of their own growing grounds for perennials and in-flower woody plants. They continued to innovate in their open sky greenhouse, where customers were snapping up fall color right and left. Some places we visited were absolutely packed during the week in mid October, so traffic driving seemed to be working – even in depressed Liverpool, where a newly opened Dobbie’s was “standing room only” in the produce and cooking departments. The main faith-restorer, though, was a place called “The Beckworth Emporium,” standing in the middle of open farmland near Northampton. The brainchild of an industry veteran who re-modeled an old propagation nursery, this place demonstrated that the U.K. garden business still has a lot to show the world. For about 15 percent of the cost of many of those big destination stores, this place had a busy local, organic produce “hall,” a butcher, baker, a 120+ seat restaurant, and a seasonal garden center that operated on a “No Bloom, No Room” philosophy. And, when the blooms were over, they replaced the plant area with an ice-skating rink while selling thousands of cups of hot chocolate! Customers sat in the café watching their kids skate past the window—how cool is that? I should caution that you take into consideration that the new or expanded ideas, categories and departments mentioned previously are being tried in a different country with a very different retail history. The U.S. has over six times the retail square-foot per capita than the British have. We all know that America is over-retailed; the U.K. has few malls, strip centers or hyper-centers. The British also had previously invested in hard, conventional garden center buildings, making some of these departments easy to switch. It’s hard to sell cheese or fashion in a greenhouse. Additionally, over the past 30 years the Brits had conditioned their customers to go to a garden center for hours to get lunch, stroll around and pick up something. They had already become less-dependent on plant sales. Still, if the English, of all people, have put gardening on hold, we should at least ask ourselves the “What If?” question, even if the U.K. solutions may not be our magic bullet. There’s no question the face of garden retailing is changing in the U.K. But the strategies the English are trying to boost business are less important than the speed of change and the depth of their commitment. Once these highly competitive owners decided gardening was stalled they jumped into other lines with amazing confidence—lots of lessons to be learned there. No one we talked to was waiting for the economy to turn around. No one was hoping for a better spring. When you have large bank payments due every month it certainly focuses the mind, and these operators were doubling down on the garden business not returning to its former glory in the near term. The message is clear from a place thought to be a nation of gardeners: What worked for the past 25 years is no longer a winning strategy. Your U.K. peers are testing a very wide variety of lines and categories to drive traffic and make money. Could that be a lesson for you?